Extremist group Boko Haram fighters burned several children to death during an attack on a village in northeastern Nigeria, killing at least 86 people. 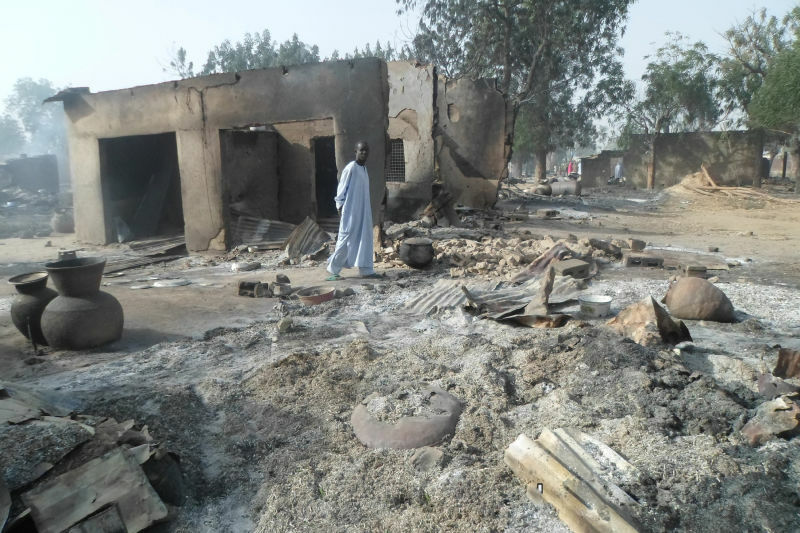 Fighters from the extremist group firebombed Dalori village and opened fire on civilians Saturday evening. The attack, which included shootings, burning and explosions continued for four hours in the village and two camps nearby housing 25,000 refugees, a survivor, whose family members died in the attack, told the Associated Press (AP). Three female suicide bombers then detonated among a group of people fleeing to neighboring Gamori village, killing scores. Nigerian President Muhammadu Buhari, who claimed in December that the country has largely defeated Boko Haram, asked the country to avoid terror and help beat the group. “I urge all citizens wherever they live to own the war against terror and to be part of the fight because it is the only way we can finish the remaining work that needs to be done to make our country safe again,” Buhari said, according to Agence France-Presse (AFP). Dalori village lies just about 3 miles from the city of Maiduguri, where Boko Haram is based. State troops arrived in Dalori following news of the attack but the AP report said that the Boko Haram fighters were better equipped. The fighters reportedly started retreating only after the military troops reached the village with heavier reinforcement. Survivors reportedly said that help took too long to reach the village, resulting in greater casualties. Over 60 people were being treated for burns, AP reported, citing Abba Musa of the State Specialist Hospital in Maiduguri. “We are still working on the actual death toll. The bodies were collected by different teams and we are going round the hospitals collating the number of bodies taken there,” Mohammed Kanar, head of the National Emergency Management Agency (NEMA) for northeast Nigeria, said according to AFP. About 20,000 people have been killed in the period of six years of a fight between the extremists and the government troops while about 2.3 million people have been displaced, Al Jazeera reported.